Born to a working class family, Julio Le Parc moved to Buenos Aires in 1942, and the following year he registered at the Escuela Nacional de Bellas Artes Prilidiano Pueyrredón. In 1947, he left school, his job and his family, and shortly thereafter he became interested in avant-garde art and became involved in experimental theater (1954). He returned to art school a few years later (1955), where he actively participated in the student movements. In these years Le Parc demonstrated his combative spirit and his leftist political views. Gradually, he combined his political views with his work in visual arts. He proposed that an artist had to be a revolutionary and a subversive opposed to cultural conservatism that he identified with the political and economic oligarchy. In 1958, Le Parc moved to Paris and began to investigate the optical properties of surface and the regular arrangement of geometric forms, to which he soon added his experiments with light. His Cajas luminosas, Movimientos sorpresa, Continuales móviles and Relieves explored the different avenues of the experience of light and medium, reflection and transparency, through the creation of virtual images by means of Plexiglas and the incidence of beams of light on small movable reflecting surfaces. These investigations, which occupied Le Parc throughout his career, translated into small format pieces, large murals, and ceiling works. With Francisco Sobrino, Hugo Demarco, Horacio García-Rossi, Jean-Pierre Yvaral and Joël Stein, among others, Le Parc founded, in 1960, the Groupe de Recherche d’ Art Visuel (GRAV), which proposed that art should include the playful and active participation of the public in daily activities. Artists of GRAV agreed to create works collectively and retain anonymity as individuals. Le Parc became one of the main promoters of the group’s activities, in works such as the Laberintos, Salas de Juego, and Une journée dans la rue (Paris, 1966). He also kept in touch with groups with similar interests, including Nouvelle Tendance and the Italians N and T.
In 1966, Le Parc presented his first solo exhibition at the Howard Wise Gallery (New York) and the Galerie Denise René (Paris). That same year he participated at the 33rd Venice Biennial, where he received the Premio Internacional de Pintura. This recognition was controversial in more than one aspect. The organizers, giving the painting prize to a kinetic work forced a revision of the rules resulting in the elimination of works in this genre from competing for the painting prize. For the GRAV, on the other hand, which tried to diminish the figure of the individual artist in favor of the collective effort, the fact that one of its main members was awarded such a prestigious individual prize led, in 1968, to the dissolution of the group. Around that time, Le Parc began the series Desplazamientos, which required the movement of the observer, and Contorsiones, twisted ribbons over a background that modified the perception of the work. After participating in the May 1968 uprising in France, he left the country temporarily. Between 1970 and 1974, Le Parc renewed his investigations of surfaces incorporating color. Between 1974 and 1976, he studied variations and shades of grays that became manifest in the first series of Modulaciones. He began to use other colors in 1978 and at the same time actively participated in politically engaged art events in Latin America and Europe, presenting important retrospectives of his work at the Casa de Las Americas (Havana, Cuba, 1970), the Kunsthalle (Düsseldorf, Germany, 1972), the Sala del Ministerio de Cultura (Madrid, Spain, 1977), the Museo de Bellas Artes (Caracas, Venezuela, 1981), and the Salas Nacionales (Buenos Aires, Argentina, 1988). In 1988, Le Parc began the series Alquimias, in which the transformations of form and color are represented in a fully articulated form. 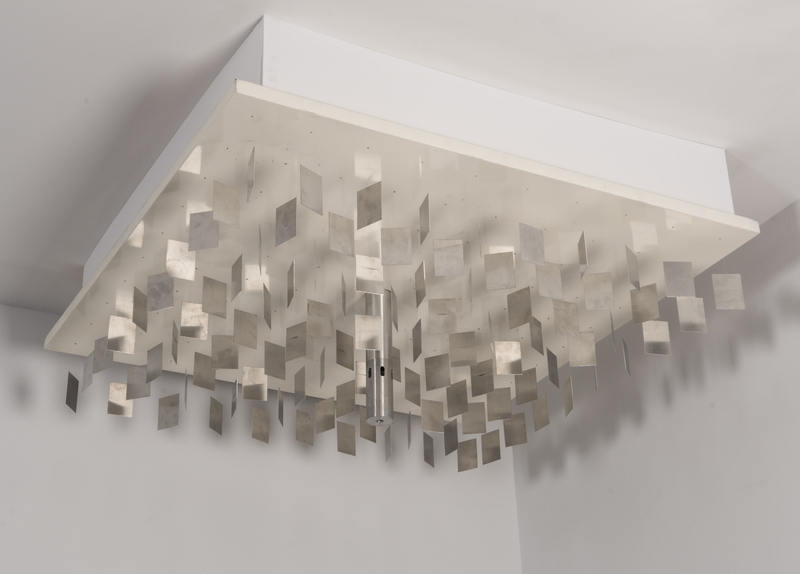 His most recent work, Esculturas torsiones includes a set of three-dimensional pieces constructed of stainless steel. Julio Le Parc lives and works in Paris.